I mix it with 4 Tablespoons of honey, 4 Tablespoons olive or coconut oil or any other oils I have in the house such as jojoba oil. Then after I wash my hair, I apply the mixture to my hair. Next I put a heating cap on for 30-45 minutes or just leave the mixture on my hair for hours when I’m running errands during the day. Wash and style my hair as usual. On the container it actually says you can use it both ways and I’m glad I tried it. I wet my hair then section the hair in manageable sections. Then apply Shea Moisture deep treatment masque and twist. The only thing I will caution about this product is that you don’t use too much if you are using it to twist your hair. I made a mistake of doing that one time and my twist out had a whitish residue on the ends. My advice would be to experiment with a little amount first, then adjust the quantity as you use the product over and over again. It rejuvinates my dry hair, so it keeps the hair moisturized and looking healthy. I only need to use a small amount for a twist out which makes the product last longer. The twist out always come out looking defined, frizz free and moisturized even without adding a gel while styling. The price is pretty good too. 12 oz for $9.99. I have bought this product more than once since I started using it. It has great slip to detangle, adds shine and hair looks moisturized / conditioned. Made with almost 100% natural ingredients. Contains NO parabens, phthalates, paraffin, gluten, propylene glycol, mineral oil, synthetic fragrance, animal testing, PABA, synthetic color, DEA, or animal ingredients. I love products made with argan oil and shea butter. 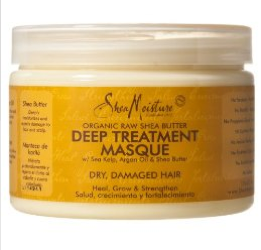 Have you used shea moisture deep treatment masque? What do you like about it?